Hooray! It's another stoner band! Or to be less cynical, The Quill from Sweden play on their fourth CD a kind of music which has already been outdated for a couple of years. The Quill surely understand to rock the right way. Their music is very hard and heavy and even the retro aspects in the music don't disturb at all. Especially the vocals make you often think of Led Zeppelin's Robert Plant or Rainbow's Ronnie James Dio. The song writing is very good, especially the groovy songs like Come What May or Close To The Sun. But their mid-tempo songs (Nothing Ever Changes) aren't bad either. On American Powder, they show that they can even be very brutal. Even if the Quill do a very good stoner job, I wonder if there is still anything new to discover in this genre. 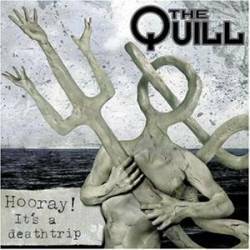 But everyone who appreciates Monster Magnet or the Spiritual Beggars will also like the Quill.